← Is the Ideal Job Candidate Flexible? How Flexible? “Film writers come together from all corners of the globe to spend two weeks living a life diametrically opposed to their everyday professional and private existence. In the first place they come as invitees’, experiencing comfort but nevertheless a degree of austerity (the palaces are reserved for members of the jury, the stars and producers)” (2009). Little has changed in the rituals of film festivals. I can see the kind of austere measures even those with steady festival work enact in order to attend the festival and do their work. For instance, I was in the press lounge one afternoon—a tight space with plastic furniture, too few computers and outlets, and complimentary coffee and water to keep the occupants going—catching up on some work. Everyone was typing feverishly, recording their thoughts of the day’s festival news. Around 3:15 snacks were brought in for everyone—chips, pudding cups, and other “grabbable” items. By 3:30, they were gone. I didn’t think much of it at first—just that it was a nice gesture on the part of the festival organization and it was a nice bonus for the press reps. But then, around 4:00, several people arrived to the lounge and were dismayed that the snacks they had been told would be available at that time were already gone. One woman left exclaiming, “now what am I going to do?” It hadn’t occurred to me that—whether money or time (potentially the more valued currency of these journalists)—they would rely on the minimal offerings to get by. The strict management of time and money are austere in the hope that they will lead to future opportunities. There are many stories of actors and directors who risk their income and more stable opportunities to reach the status that they have. At film festivals, I see these stories play out. Leo Howe describes this kind of risk as “contingent” risk in that the risk lies not in the current performance of an action but in its outcome and the hope for future performances (2000). Volunteers, filmmakers, journalists, and many others scrape together enough time and money to attend, putting themselves in financial risk to do so. One friend, who had spent so much time and money attending TIFF and other festivals as an aspiring media journalist, found himself relying on friends for a place to live. His apartment lease had lapsed and in the little time he had off work—his primary income—he could either continue hustling to change his career or he could find a new apartment in the increasingly high-priced Toronto area. Banking on potential work, he slept on couches, hotel room floors, and, on occasion, in a local flophouse or on a cold park bench. While his connections and persistence eventually paid off, it was a risk that he and many others are taking when they bet on the festival’s promises of connection and development. Young filmmakers, actors and even small-scale producers find themselves in the same situation as they live or travel to the city—relying on their parent’s help, overextending credit cards, or saving costs by housing 10 crewmembers in a tiny hotel room. At other times, the goal isn’t about furthering careers. It is simply for the experience of the festival and the friendships that develop between those who attend. Another friend has attended the film festival for about twenty years. I had the pleasure of meeting her on my very first day at my very first TIFF attendance. I fortuitously sat beside her at the world premiere of Jennifer’s Body, the opening film for the 2009 Midnight Madness Program. We started chatting, and she was extremely informative about the festival, the program, the movie, the sponsors, and anything I asked about. She introduced me to some of her fellow Midnight Madness attendees who would take turns getting in line very early so that they could all be at the front of the line and subsequently get the seats they wanted when it was finally time to go into the theatre. She invited me to join them the next day. I was a little hesitant, but after chatting with her at subsequent screenings and getting a feel for the crowd, I joined her and the others at the front of the line. 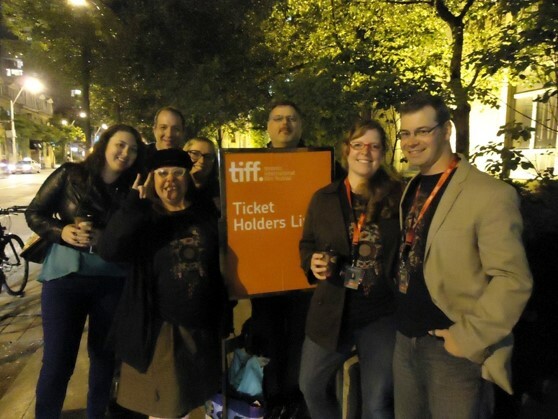 They became my TIFF host family of sorts. For the rest of that year and those to come, we would check in with one another and then meet up in the evening to see the latest Midnight Madness flick. This year, however, I learned that this loyal TIFF-goer wasn’t going to be attending Midnight Madness. She didn’t explain right away, but when we ran into one another on the first day, she elaborated. It had been a tough year. In January she had lost her job and then couldn’t afford her apartment. The mental anguish led to a stay in the hospital, and while she was now feeling better, she was still too strapped for cash to attend the festival as she had in years past. With the help of some friends, she was able to see some films—and she is hopeful that in the future she will be able to return on her own—though she may be pickier about what she chooses to see. Over the years, several people from that Midnight Madness crew had not attended in particular years because they couldn’t afford to take time off work or didn’t have a job at all. They recognized that the festival was not necessarily essential to their physical well-being, but it was a time to reconnect with friends who shared the love of cinema in a way that they couldn’t do the rest of the year. They missed this time with friends and were missed in turn by those friends. 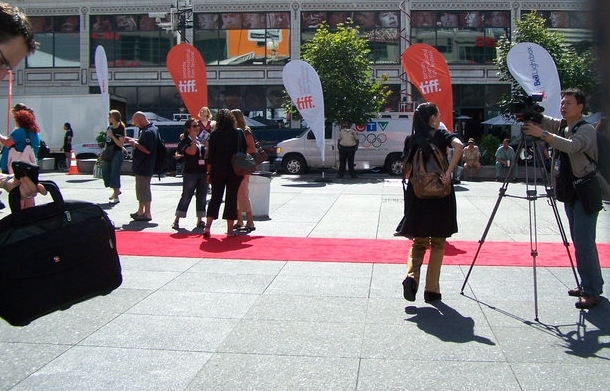 TIFF is an annual highlight for me and many others. Thousands of people work at the festival, tens of thousands attend the festival, and the local economy boasts millions of dollars in direct and indirect revenue because of the festival. But for many, there is a price of attendance that extends beyond the cost of a ticket. There are risks and sacrifices made to stay connected with friends or further one’s career. 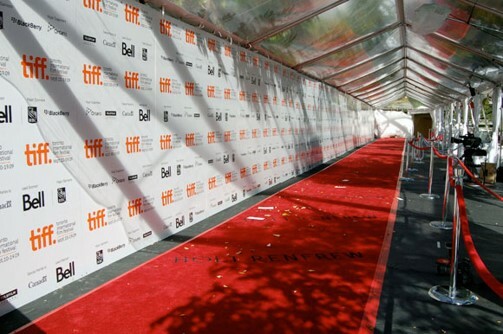 The flashing cameras and smiles on the red carpet draw much of the attention at film festivals, but just beyond the velvet ropes are the people of the film festival, those who attend the festival and those who work to make the festival happen, risking much for the experience itself. Bazin, André. 2009. “The Festival viewed as a religious order” In Dekalog 3: On Film Festivals. Translated and Introduced by Emilie Bickerton. Edited by Richard Porton. London: Wallflower Press. Pp. 11-22. Csikszentmihalyi, Mihalyi. 1975. Beyond Boredom and Anxiety: Experiencing Flow in Work and Play. San Francisco: Jossey-Bass Publishers.